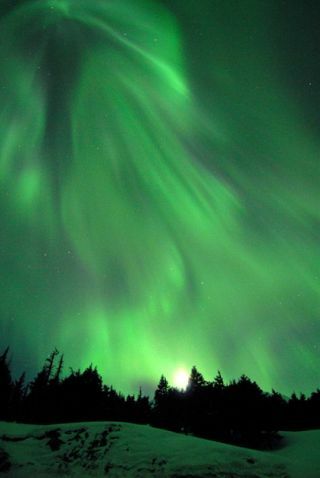 Tuesday, December 28, 2010 The northern lights hang along the planet's magnetic field. For the first time, scientists have measured the strength of the field in Earth's core. Forthe first time ever, a scientist has measured the strength of themagneticfield inside Earth's core, some 1,800 miles (2,896 kilometers)underground. Itturns out the magnetic field in Earth'scoreis about 50 timesstronger than on the planet's surface, and the new number may helpscientistsnarrow down the possible heat sources that fuel the mysteriousprocesses of theplanet's interior. "Ameasurement of the magnetic field tells us what the energy requirementsare andwhat the sources of heat are," said Bruce A. Buffett, a professor ofEarthand planetary science at the University of California, Berkeley, whomade themeasurement. Scientiststhink that Earth's heat comes from three sources: the residual heatfrom theformation of the planet around 4.5 billion years ago, when the planetwas hotand molten; the release of gravitational energy as heavy elements sinkto thebottom of the liquid core; and the radioactive decay of long-livedelementssuch as potassium, uranium and thorium. Thecooling Earth originally captured its magnetic field from the planetarydisk inwhich the solarsystemformed.That field wouldhave disappeared within 10,000 years if not for the planet's internaldynamo,which regenerates the field thanks to heat produced inside the planet. Theheat makes the liquid outer core ? which is about 1,400 miles (2,253km) thick? boil, or convect, and as the conducting metals rise and then sinkthrough theexisting magnetic field, they create electrical currents that maintainthemagnetic field. This roiling dynamo produces a slowly shifting magneticfieldat the surface. Buffetpulled off the geophysics milestone by harnessing the aid of somedistanthelpers: the moon and quasars? extremely brightand distant active galaxies. Quasarshurl from their luminous hearts a steady stream of radio waves thatprovide a consistentbackdrop against which Earth's most minute wigglings are noticeable,andmeasurements of these radio waves from ground-based and satellitetelescopesallow for very precise data on changes in Earth's rotation axis. Bylooking at these changes, and how they are affected by the moon'sgravitationaltug on the Earth, Buffet was able to make his calculations. "Istill find it remarkable that we can look to distant quasars to getinsightsinto the deep interior of our planet," Buffett said. He'snow at work on a second-generation model, and admits that a lack of informationaboutconditions in the Earth'sinteriorhas been a big hindrance to making accurate models. DoesEarth's Surface Interact With Its Interior?